Waste Management prices came directly from their website Express Roll Off Dumpster Rental surveyed ten locally owned roll off companies for prices Size: 20 yard dumpsters Type of debris: construction debris only Where: 7metro areas in Brevard County Florida Note: We wanted to compare 10 yard and 15 yard dumpster prices as well, but WM doesn’t offer these container sizes in our market. Local dumpster rental companies offer much cheaper dumpster rental prices than WM. In most markets, it's not even close. Local hauler in Brevard County Florida average price for 20 yard dumpster: $367 (Express Roll Off is less than this- for a 14 day term vs. 5 day like WM). 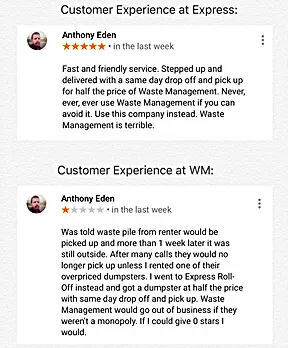 Waste Management average price for 20 yard dumpster: $585 Conclusion : Consumers are better off renting from local dumpster companies in the area. Sometimes companies include a tonnage amount in their price (brokers are famous for doing this too). This can make a company appear cheaper initially, but if you go over the tonnage, this is an add-on fee they can charge you with after your dumpster is removed and dumped. Be careful of al la carte add on charges. Local carriers average included weight: 4.61 tons WM average included weigh for rental: 4 tons Extra charges typically only come into play if the included weight is exceeded when the dumpster is dumped. Most haulers typically price these overages on a "per ton" basis (per 2000 lbs). The additional charges for weight were similar between the two groups, with a slightly lower price for the locally owned operators, on average. Express Roll Off does not do this. We only charge for actual tonnage (that the local dump may charge us).